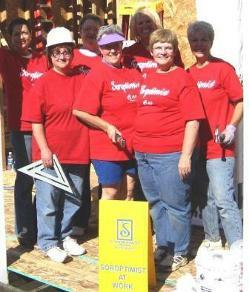 On Saturday, October 25, 2008, eight SICC members bravely gathered at two Habitat for Humanity homes under construction in Valley Springs. Together, with the home owners, the job foreman and Habitat for Humanity supervisors we jumped right in. With hammers and saws, staple guns and paint rollers, each of us learned new construction techniques we’d never considered, much less attempted. And, yes, the following day had the aching muscles and joints, and paint in the hair to prove our efforts. This day wasn’t about our effort, however but about the job of hands-on service. To met the two young families who would soon be moving into their dream homes, to see their excitement and dedication to their home’s construction, made every sore muscle worth it ten times over! 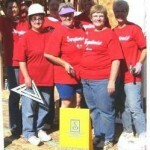 To see the results of our labor, in both the homes and in the home owners’ smiles was a blessing to each of us. Thank you to those who patiently guided us through our tasks at hand, and especially for their sense of humor. We enjoyed a wonderful catered lunch at noon, donated and trucked in by Foxes Inn of Sutter Creek. Thank you for the scrumptious taco salad lunch to help us keep up our strength for the remainder of the afternoon.